BOYDS, MD (Aug. 28, 2017) – The Washington Spirit’s two U.S. Soccer Development Academy programs, in Maryland and Virginia, will kickoff on Sept 2. The four Washington Spirit Academy – Virginia teams will host New Jersey’s Cedar Stars Academy at the Maryland SoccerPlex, while Washington Spirit – Baltimore Armour teams will travel to Pennsylvania to face PA Classics. CHICAGO (Aug. 28, 2017) – The U.S. Soccer Girls’ Development Academy is set to kick off its inaugural season on Sept. 2, marking the start of competition for more than 6,000 players from 69 member clubs. The Academy develops world-class players by impacting everyday club environments across the country. 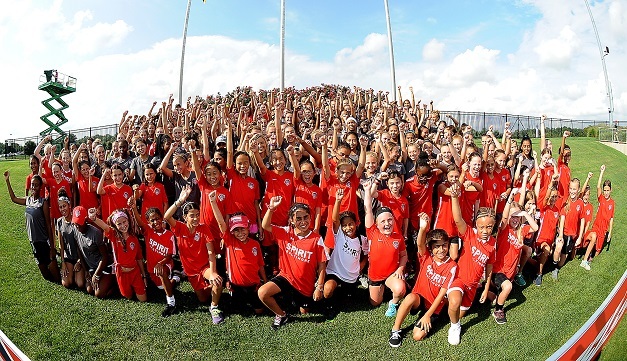 Following 10 years of success for the Boys’ Academy, the Girls’ Academy launches this fall to bring the development initiative to female youth players. A total of 108 games will kick off on opening weekend, highlighted by the Girls’ Academy’s first feature match in Somerset, N.J. between Sky Blue – PDA (Somerset, N.J.) and FC Virginia (Chantilly, Va.) in the U-16/17 age group (2002/2001 birth years). The game will be streamed live at 11 a.m. ET on the U.S. Soccer Development Academy Facebook Page. The Girls’ Academy is the highest level of girls’ youth soccer in the U.S., and its start represents the implementation of the Academy’s philosophy and standards for the most committed youth clubs across the country. Academy clubs have an increased focus on training (minimum four training sessions per week) and play fewer total games in favor of more meaningful contests using international standards. The program prioritizes individual development ahead of winning team trophies and titles. A U.S. Soccer player development initiative, the Academy provides direct access to the Federation’s resources. Clubs receive a wealth of support with coaching education, scholarship funding, Academy staff dedicated to serving clubs, and support from Academy Technical Advisors that reside and work in club markets. It also provides a clear pathway to National Team programs. More than 92 percent of players selected to Youth National Teams in the 2016-17 cycle came from Academy clubs, and 65 players from the most recent Women’s and Girls’ YNT rosters will feature in the Academy this season. Hickey and Heinrichs will hold a conference call on Wednesday, Aug. 23 at 3 p.m. ET to discuss the Girls’ Academy launch. A global leader in women’s soccer, U.S. Soccer’s implementation of the Girls’ Academy is part of the Federation’s efforts to grow the game and ensure that future National Teams continue to win at the highest level. Several current and former Women’s National Team players are involved in the Academy to further this mission. Their experiences winning FIFA Women’s World Cups and Olympic gold medals will be invaluable in raising the standard for female youth players. U.S. Soccer is launching the Girls’ Academy with backing from the National Women’s Soccer League. Now in its fifth year, the league is the longest-tenured women’s professional league in United States history. A total of 11 Girls’ Academy clubs are affiliated with NWSL teams, marking a major step forward in the league’s player development initiatives and the long-term growth of women’s professional soccer. For its first season, the Girls’ Academy will feature four age groups: U-14, U-15, U-16/17 and U-18/19 competing in seven divisions across the country. Teams play consistently during a 10-month season from September to July, featuring Winter, Spring and Summer Showcases and culminating in the Academy Championships. The inaugural 69 clubs were chosen based on a variety of factors, including club leadership, infrastructure, resources, history of player production for National Teams, market and depth of the player pool and more. For more information on the U.S. Soccer Development Academy, please visit ussoccerda.com.